Radiosurgery is one of the most important and versatile instruments in dentistry today. Its numerous uses range from performing surgical incisions to establishing haemostasis. The radiosurgical instrument uses a high frequency radio signal to perform the incisions. The radio signal produces a finer, micro smooth sterile incision with immediate haemostasis and minimum tissue alteration. 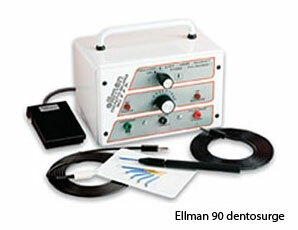 It offers the advantage of a safe, fast, and efficient incision with a better field of visibility. The patient receives a pressure less cut with a minimal amount of bleeding which often requires no suturing. Most common use in dental cosmetic surgery is to sculpt the gum tissue around front teeth to give it an even height and form, and to elongate the clinical crown (gingivectomies). Also used to reduce "gummy smiles" in conjunction with bone alteration (crown lengthening) and lip repositioning procedures. Other indications are: sterilising root canals, troughing of sulcus around crown preparations to enhance optical and normal impressions and to facilitate bonded placement of restorations, removal of overgrown gum soft tissue. The ability to vary the wave form of the radio signal, together with the combination of the different active and passive electrodes which are self-sterilizing, offers numerous advantages. It prevents seeding of bacteria into the incision site and eliminates scar tissue formation. Healing time is reduced significantly.